News Making - Is the Global Water Crisis Real? You have 50 minutes to study the slide show to the right and then create a 5 minute news report to be filmed 'live' at the end of the lesson. Divide the 26 slides into the number of people in the class. Each student should specialise in a section of the presentation to be filmed. A PDF version of the presentation can be found here. Students can write their names next to each slide. ﻿﻿Objective: Analyse the hydrological changes resulting from the construction of dams and reservoirs. Examine the costs and benefits of dams and reservoirs as part of multi-purpose schemes. Complete tasks 1 & 2 on the work sheet above right. Read Geofile 410 September 2001 and make notes on the generic social, economic, environmental, political and issues (SEEP) surrounding dam construction. a. Click to read this BBC Futures article - Outline the environmental impacts of dams to affected areas. c. Outline what has been done in the Grand Canyon by reading and highlighting this 2012 article from the Daily Mail. China & Three Gorge Dam Project. Use this SEEP framework sheet to record Three Gorges Dam information as you read it. c. Watch the YouTube videos to the right. Human Mismanagement Case Study - The Val di Stava Dam collapse occurred on July 19, 1985, when two tailings dams above the village of Stava, near Tesero, northern Italy, failed. It resulted in one of Italy's worst disasters, killing 268 people, destroying 63 buildings and demolishing eight bridges. Objective: To explain stream channel processes and explain the resultant land forms found on floodplains. Starter - Study the geographyalltheway.com slideshare to the right and take notes on the four different types of river erosion on page 4 as well as the four types of transportation on page 5. Task 1 - You are going to create a three strip cartoon about your allocated features under the headings above. Paper 2 - Exam Question. Watch the five videos above. Making notes on the processes of formation, use at least four examples of the features to attempt to answer the question above. Don't forget to use the IB Essay Planning Tool. Objective: Examine the human modifications of a floodplain and their effect on the size and probability of floods. Task 1 - Turn to page 90 of Waugh - Integrated Approach. Use the A3 outline sheet to annotate on the features of a river with 1. Free Reign and 2. that has been corseted. Add suitable titles to your work. Task 2: Evaluate the costs and benefits of alternative stream management strategies (PowerPoint). Click here for the worksheet to fill in using Toulouse as the case study example (Note: Website is in French and will require a good understanding of the language to complete). Click here to access the website in Toulouse. You will be given two plans of Toulouse town centre and must come up with a display to show residents of Toulouse what is being done to protect them from a catastrophic flood event as seen in the 1875. 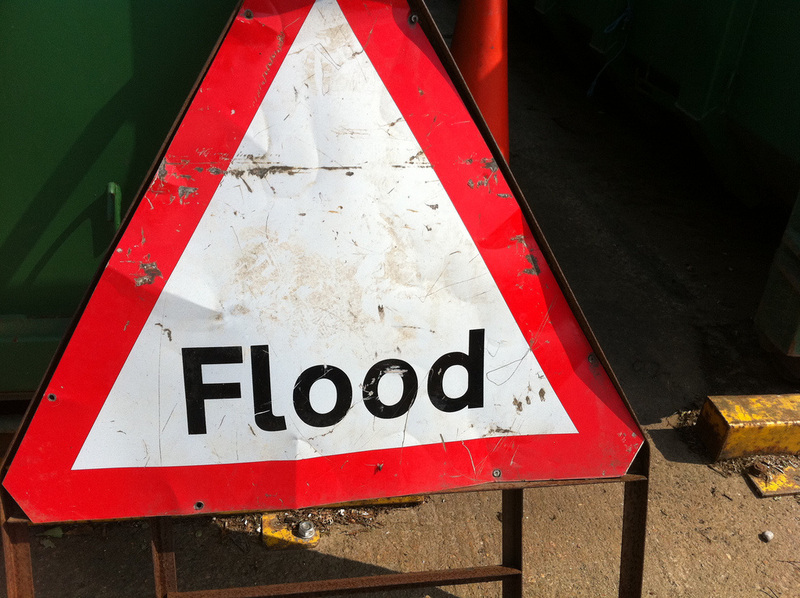 Create a timeline of events using this page showing the historical flooding events in Toulouse. Perhaps create a living graph to show the flood events linking the chart with some photos. You could also locate historical photos of the events on the map of Toulouse. i. Using this interactive plan, annotate on all the levées protecting the city and inhabitants. Here is your photo sheet. ii. Using this information page as well as the animation, locate the pumping station in Sept Derniers on the map and take two sreen shots of the system before writing a brief summary of how the system works and what it prevents from happening. **Optional Extra** - Here is the sheet for the IB Toulouse boat trip to see in practice what we have been learning about. Turn to page 93-97 in Integrated Approach and use the Colarado basin as your focus to answer the IB style question below. The Year 11 will be starting their unit on rivers in January 2013. As part of their study, they will complete a Decision Making Exercise on the best way to protect a place from flooding. Your task. Working in your groups of three (as previous activity), design and produce a short Decision Making Exercise for the Year 11 where they have a section of a river to protect from flooding (you choose the river and country) and they have to choose the best way forward. Step 1 - Study this list of different types of flood protection strategies and note the pros and cons. These will be the options for the decision. Step 3 - Create three or four scenarios that the students have to choose from, one of which is clearly the best in your expert IB opinion. They will then have a 15 mark response to complete. Here is a real GCSE example from 2012. Print out the resource booklet and the exam paper with one 15 mark question for the students to attempt. Don't make it too complicated as you will be marking it! Step 4 - You should produce a mark scheme with a model GCSE full mark answer. Remember, they can still gain marks on the other 'wrong' responses if they demonstrate good Geography links and skills. "Groundwater is used by 2 billion people worldwide making it the single most used natural resource" Planet Earth Sciences. Starter - Under the title and quote above, produce a sketch map of Australia with the extent of the Artesian Basin highlighted on top. Task 1 - Explain the functioning and management of artesian basins and aquifers, distinguishing between natural and artificial recharge. Task 2 - Turn to page 8 - Rivers and Water Management - Garrrett Nagle. 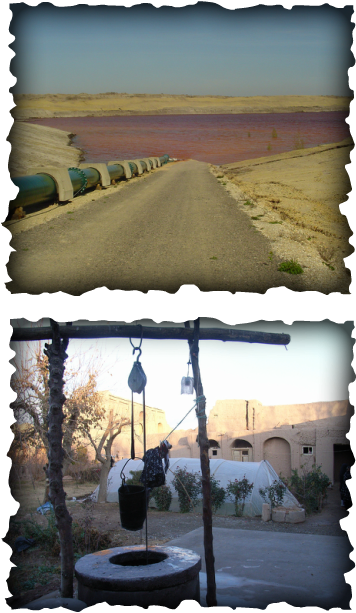 Read the section entitled Groundwater. a - Outline what is meant by the phreatic zone and ouline the different layers within. b - Groundwater accounts for what % of freshwater on earth? c - Why is some groundwater considered to be a non renewable resource? e - Outline the key ways in which groundwater can be recharged. g - How can groundwater be lost? h - Make a sketch of diagram b on page 10 - Groundwater in Semi Arid regions. This links in to your case study on the Great Artesian Basin in Australia. Task 3 - Getting the water out. Make some revision notes based on the video to the right. Include details of how water has been traditionally extracted from deep under the surface. Task 4 - Practical human uses of the GAB. Watch the video below to make notes of how rural communities use the GAB from 17.40 to 23.00. Task 5 - Over extraction and the GAB - Go back and watch the video in task 4 from 23.00 to 32.00 and make notes on the impacts of over extraction and what is being done to prevent it. Task 1 - Read over the three articles underneath and complete two case studies on the environmental impacts of groundwater abstraction in different global locations. Examine both the causes and effects that this abstraction has on areas and communities that are affected. Task 2 - Africa - The full extent of groundwater supplies. Starter: Watch the first video to the right hand side. a. 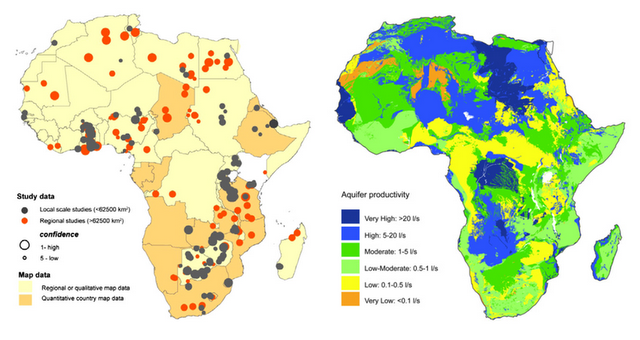 Read the breaking news from April 2012 - Huge Groundwater supply found beneath Africa. BBC news article here & study the graphic to the right (click to enlarge). a. What implications could this have on health and well-being in Sub Saharan Africa? 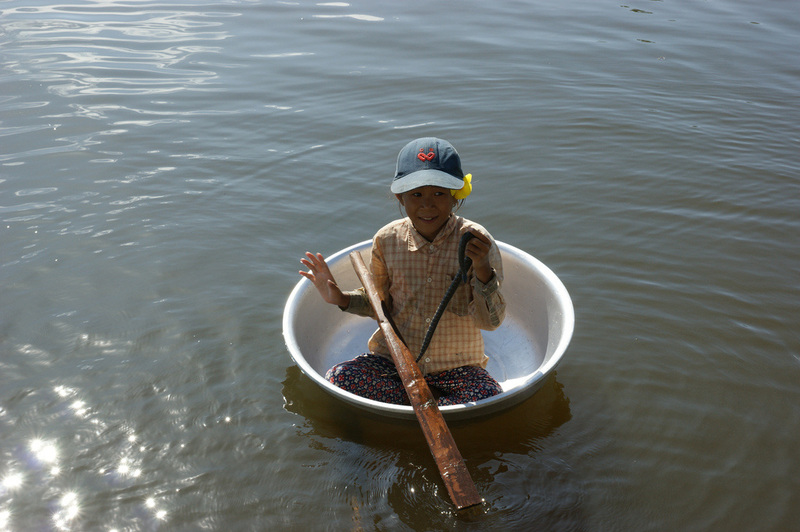 Think of access to freshwater, water-borne diseases, agriculture. b. Pay particular attention to those areas where there is the highest productivity. c. Use the CIA World Factbook for key data for those countries. d. Include a copy of the graphic to the right in your mini report. Extra Research - Watch the last video to the right and take notes on effects of Groundwater extraction on the environment. Africa: Further information can be found here. Objective: Describe the role of wetlands as a water resource. Click here to be taken to an explanation of how wetlands are utilized as a water resource. Task 1 - Using this worksheet, create some revision notes outlining the major values and a brief explanation of each. management strategies that have been adopted in Florida USA. Task 2 - Using the Google Map below, write an accurate description of the site (actual location) and situation (in relation to what is around it) of the Kissimmee Wetlands. Task 5 - Watch the video to the right (don't worry if you can't understand the old guy at the beginning - he's not too important!) and take notes on the key areas of progress. 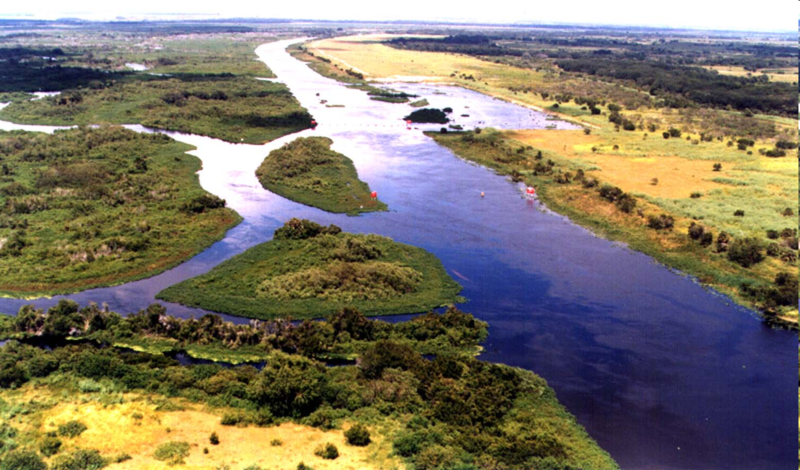 Task 6 - using the embedded PDF below, outline the major environmental developments since 1992 in the restoration of the Kissimmee River system. Task 7 - Create a table to show the management methods used to return the system back to its original state. Task 3 - Watch the (slightly military, fast paced!) video above and take notes. Click here to access the associated PDF. i. Use the hyperlink above to explain the background to the project. ii. What happened to this natural system? iii. Why was the system altered? … in response to what? iv. How was it altered? Objective: To examine the environmental impacts of agriculture and irrigation on water quality: salinization, agro-chemical runoff, the pollution of ground water, the eutrophication of lakes, rivers and wetlands. You will be completing a four part case study looking at the different effects of agriculture and irrigation on water quality. Each of the parts should take you around 15-20 minutes to complete and there is an exam question at the end to plan and produce. Open this link and read the information on Salinization. Summarise how the process happens and how it is linked to irrigation and agriculture. Briefly explain how its effects can be combated. Also embedded to the right. Open this link. It explains the problems caused by Salinization in the Adelaide, SA. Read over the document but pay particular attention to ‘The stressed Murray-Darling River system’ and ‘What is water salinity’? Task 4 - Watch the video to the right hand side. •How much pesticide is used every year? •Links to agriculture and runoff. Task 5 - Read this case study from the USA and make notes on the causes and the effects on the location population and environment. Task 6 - Watch the video below and read the information on the web link here about groundwater pollution. Task 7 - Summarise all the ways that groundwater pollution can occur by agriculture and irrigation and the associated management strategies. Task 8 - Turn to page 494 of Integrated Approach and Copy Figure 16.50 under the heading at the top of this slide. Task 9 - Read this Guardian newspaper article and summarise the main causes of eutrophication of the lake in the USA. Task 10 - Use your internet reserach skills to find and print out a case study of eutrophication of a freshwater resource. If you are struggling, use this resource to get you started.